I have been a dedicated flame-working artist since 1995. 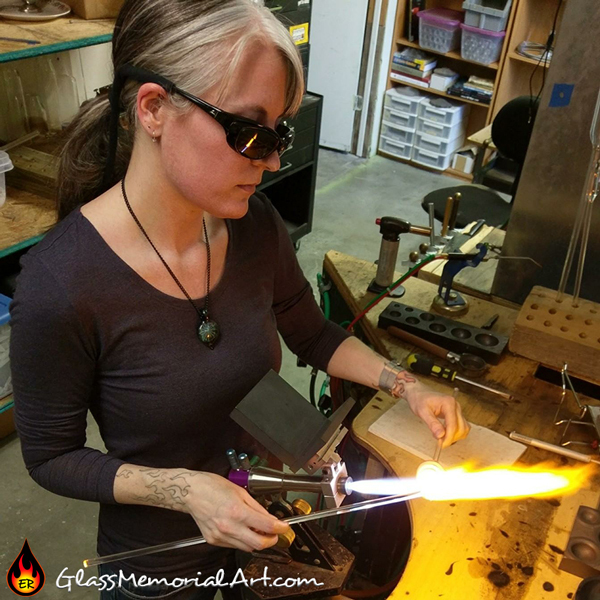 My passion is glass memorial art and bringing joy to people in their time of loss. Memorial art is a delicate and meticulous process which took me years to refine. Cremains are a natural and sacred artifact of a life. Having experienced loss myself, I know how invaluable these remnants are and I handle them with great care while they are in my possession. I will expertly encase a small amount of ash within an heirloom quality piece of glass art. This creates a permanent keepsake that you can hold in your hand, keep close to your heart, or present as a gift. In my store you will see examples of finished pieces that I have done for myself and others. You may choose one of these styles, or ask to incorporate a design element that speaks to you about the essence of your person or pet. Thank you for allowing me to assist in memorializing your loved one and aid in your grieving process. Please feel free to contact me if you have questions or would like any further information.